We had written a separate post on this. PTI and IANS chose to deliberately obfuscate the truth, in an attempt to post an unclear picture, when the facts were very clear. A Hanuman Jayanti procession was attacked by stone-pelting by some members from the Muslim Community. But PTI, IANS and subsequently all media, did not name the community. Instead they chose to use words such as “some miscreants” and “people from a specific group”. This although it was clear which community was involved. Eventually this stone-pelting resulted in violence, arson and 3 days curfew. In the latest war of words in AAP, Bhushan wrote another letter to Kejriwal. NDTV reproduced the letter on its site in above post, but conveniently edited out a particular paragraph which had allegations against Kejriwal of being Communal. Times of India too had a story which claimed they had published the “FULL TEXT” of the letter, but they too omitted this paragraph. We had written a full post on this here. Amusingly, NDTV added a footnote saying “This piece has been edited for brevity and in keeping with our legal guidelines.” It is intriguing how the same paragraph was edited out by both NDTV and Times of India for “brevity”. As for “legal guidelines”, NDTV isn’t one to show much concern for the law on most occasions, involving BBC documentary broadcast or its own tax issues. This is an extremely curious case, on which we had reported separately. Gen V K Singh received lot of attention for his visit to the Pakistan Embassy. Just one week after this, he spearheaded a daunting rescue mission in war-torn Yemen which was applauded by the entire world, but he felt, and rightly so, Indian MSM hadn’t given due credit to their efforts. In response, he made a sarcastic remark saying that “His rescue mission is probably isnt as exciting as his visit to Pakistan Embassy“. Now starts the theatre of the absurd. Times Now spun this statement as if the General was demeaning the rescue ops and trended “#VKDisaster”. NewsX had a debate on this issue. IBN editor Zaka Jacob declared that V K Singh was “insensitive” to the plight of people in Yemen. All this, even though Gen V K Singh was personally overseeing the rescue ops from Yemen itself. Is Indian MSM that dumb? Or were they acting too smart and purposely misrepresenting Gen V K Singh’s views, to shield themselves from the criticism? We had covered this issue in a separate post here. Facebook had deleted many inactive accounts, and thus deleted their “likes” too, which resulted in a sudden, massive drop in “Likes” to almost all Facebook pages. They had clearly stated this a circular. Yet, Aaj Tak chose to use this data, i.e. a sudden fall in the Likes on PM Modi’s page, and claimed this drop was a result of waning popularity of Modi, due to the Land Acquisition Bill. This was a blatant lie, to fit a data point, into a narrative. In fact head of BJP IT team, clarified to India Today the reason for the same, yet they decided to publish outright lies. 6. 12th April 2015: Pune Mirror – Narendra Modi wearing a Louis Vuitton shawl. Among other things in the above report, Pune Mirror stated that Modi “emerged at Orly, France, in a flashy shawl, which twitteratti said is a signature Louis Vuitton“. As admitted by them, this information about the brand of the shawl was based only on “Twitterati”. We traced the rumour here, and how Louis Vuitton’s official handle denied having ever made such a shawl. The issue was small, the brand of a shawl, but the games played were bigger, as to how costly it is and how a “chaiwala, a humble” PM could afford such luxuries. The narrative was going right in the direction of the “Rs 10 lac suit“, which again started of as a Twitter rumour and ended in Rahul Gandhi’s speeches. Luckily, this time the lies were nipped in the bud. This is both hilarious and sad. Indian Express tried to pass of a post by a facebook page called “Unofficial Dr Subramaniam Swamy” as a quote by the real Subramanian Swamy. The said page is run by some fans of Dr Swamy. We had written a separate post on this issue, explaining what the quote was. Later, once Dr Swamy threatened Indian Express with legal action, the story was hastily taken down. b) Hindu kids are wearing Saffron and Muslim kids are wearing Green, when the truth is ALL students of one school wear saffron, while ALL students of the other school wear Green uniforms. We had covered this story here. As is the case, this deliberately twisted story was later covered by other media like India Today group, who even claimed this is happening in “Modi’s Gujarat”, although he has left Gujarat for almost a year now. 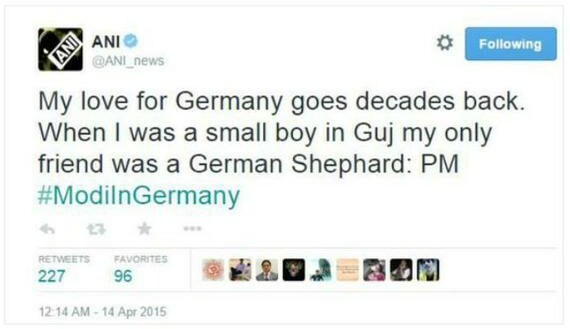 Also, Rajdeep Sardesai chose to tweet this story without even verifying the accuracy. This story started with the following screenshot being circulated on twitter. This was later confirmed from the official handle of ANI and ANI went to the extent of filing a police complaint with the Cyber Cell, against this fake tweet. This version seems to be reliable since the tweet in question, misspells the word “Shepher” which shows it was probably the act of some lowly troll, rather than a News handle. Inspite of all these clarifications, Firstpost ran a story which said that ANI first tweeted this tweet, then deleted it, and then later claimed it was a fake. 10. 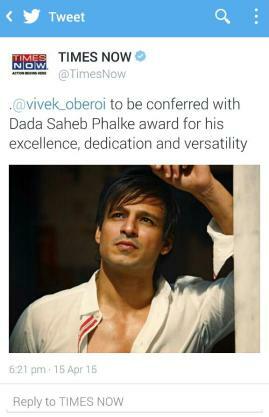 15th April 2015: Times Now – Vivek Oberoi to be conferred Dada Saheb Phalke Award. Times now via a tweet (which was deleted within 30 minutes) claimed Vivek Oberoi had been awarded the Dadasaheb Phalke Award by the Government of India. Facts however were different. 2015’s Phalke award was already declared to Shashi Kapoor in March 2015. The award which Vivek had received was a similarly named award from a private body. Times Now had even managed to get a byte from Vivek on this story. Later that tweet too was deleted. We explored the possible ramifications of this fake news here. Indian Media has some serious issues in understanding English. Via above tweet, and via this deleted article, Times of India declared that Canadian PM had announced Visa on Arrival for Indians. The Times of India tweet seems to be the earliest instance of this news. 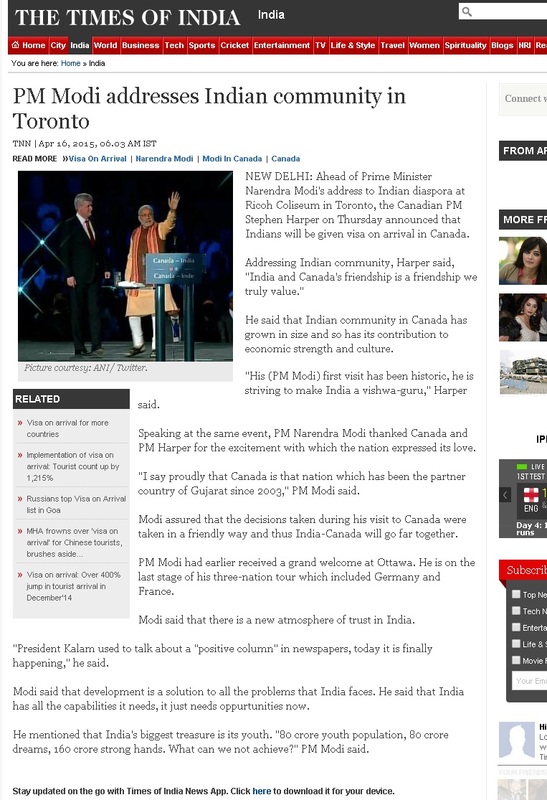 But, this video of PM Harper’s speech, by India TV, shows he only referred to India’s Visa on Arrival program and did not even hint at a similar Canadian program. Ironically, even the India TV news bulletin in that video, claims that Visa on Arrival has indeed been announced for Indians. It takes special skill to get something diametrically wrong. Above report says HRD Ministry has “backed off” and “refused to interfere” in Swamy’s 40 year old dispute of settling his dues. This is comically the exact opposite interpreatation of what has happened. The report itself mentions towards the end, that the HRD Ministry has now said that “service rules (of Central Government) are not applicable to IITs” and hence the decision on Swamy’s dues is left to IIT Board. Economic Times interprets this as “backing off” from Swamy’s case, where as HRD has only made it easier for Swamy to get his legally available dues. The “service rules” were hindering Swamy’s case and now the HRD has said they are not applicable, thus making Swamy’s case smoother. But Economic Times reported the complete opposite portraying it as a blow to Swamy. Swamy himself clarified this issue in his tweet. This lie was first mentioned in passing in an Outlook post from last year, and has now resurfaced as a full fledged post in IndiaSamvad. This new post alleges that Millionaire Rakesh Jhunjhunwala’s daughter Noopur has been hired by Smriti Irani in GoI. It also says that Irani has taken loan of Rs 1.75 cr from Jhunjhunwalas and hence has appointed their daughter. While the loan part is true, the part about hiring Jhunjhunwala’s daughter is fully false. This Forbes interview of Jhunjhunwala from 2014 informs us that his daughter is only 10 years old. This interview of 2010 tells us that his daughter’s name is Nishta and she was born on 30 June 2004. This information is corroborated by numerous interviews. From this it is clear that Outlook and IndiaSamwad have both been doing a hitjob on Smriti Irani. The Hindu ran an interview of Arun Jaitley, using the exact above headline. It gave an impression that Arun Jaitley has used the term “Saffron Bullying” in describing some elements. The introduction to the full transcript of the interview says that Jaitley spoke about the “vexatious saffron bullying by some of the Central Ministers”. But when we actually see the transcript, it is clear that Jaitley never used the above phrase. In fact this term “Saffron Bullying” was used by the interviewer herself in her 3rd question. Attributing this term to Jaitley is incorrect. 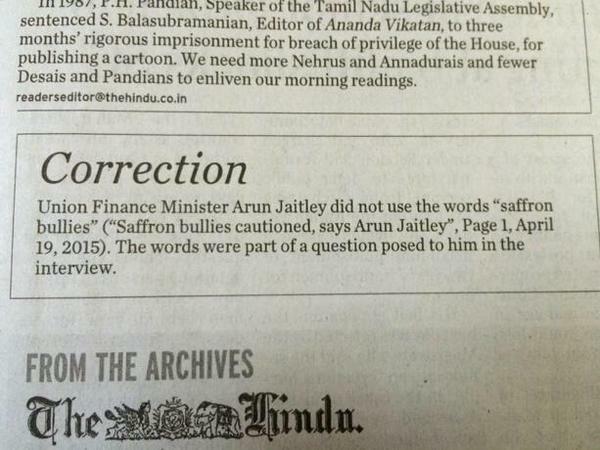 There was outrage on Social media, after which The Hindu printed a correction clarifying this issue. We had written a separate post on this. In 2013, an NGO submitted a plan to the Delhi Government to divide Delhi into 2 “Imperial Cities”. This was done in order to help in getting a UNESCO Heritage City Tag, which would boost Tourism. This proposal was forwarded by the Delhi Government to the Central Government, which approved it. The Delhi Development Authority then planned to rename these 2 parts of the city, in order to help the proposal get clearance from UNESCO. As is obvious, this was the plan of an NGO, approved by Delhi State Government and late by Central Government. But Firstpost and Scroll.in deliberately chose to lie and claim this is Modi’s idea. They used this chance to take various illogical pot-shots on Modi. Eventually Scroll.in also changed their title, but forgot to edit the piece. 16. 22nd April 2015: International Business Times / IndiaTVNews: Sachin Tendulkar’s Daughter Sara to Enter Bollywood? My daughter Sara is enjoying her academic pursuits. Annoyed at all the baseless speculation about her joining films. 17. 25th April 2015: NDTV and Times Now: Pictures from an earthquake in Philippines passed off as Nepal Earthquake pics. There are so many half truths and whole lies in this news report, we had to write a separate post for this. Indian Express got the name, location and photo of the “village” they were reporting wrong. They got the caste of the person they interviewed wrong. They used illogical information to arrive at a conclusion that Modi is not supplying aid to a “Dalit Village”. For details, read the full post.